History and firearms go hand in hand as firearms played such a significant role in way the world developed, both militarily, geographically and culturally. Unfortunately, there is a good deal of mutated history, usually resulting from Internet copy and paste and misinterpretation. Wikipedia is the biggest culprit with its “What I know to be true, even if completely erroneous” approach to information. The brief paragraphs that follow present concurrence of historical information extracted from identified credible sources. My thought is that this would give the reader an opportunity to go to those sources to validate if they choose. While Remington offered their cartridges in a variety of action types, as did other manufacturers, none achieved the popularity of the Winchester cartridges chambered in the Winchester Model 94. Still, the 35 Remington cartridge persevered with its most notable commercial success, post 1953, coming from the Marlin 336 lever action. A little irony in the fact Marlin is currently a Remington brand. What can you feed a Marlin 336 35 Remington? The nomenclatures “Medium” and “Large” game are the ammo makers’ terminologies. Generally speaking, medium extends to 300 pounds of body weight and large extends to 1,500 lbs. This does not include big and dangerous game like brown bear and similar size species, but it does include deer, hogs, black bear, elk, and at least Maine moose. The 35 Remington is a lever gun with open sights and is generally a 100 yard to 150 yard proposition, mostly by the nature of the hunting environment it sees and its typical open sight configuration. As a matter of ballistics, tables for Federal 200 grain flat nose ammo, one a 100 yard zero, show a drop of only -10″ at 200 yards, but at that distance, kinetic energy has fallen to just 838 ft-lbs. However, Hornady’s 200 grain FTX ammunition retains a velocity of 1503 fps and kinetic energy of 1003 ft-lbs out to 300 yards, understanding a 20″ barrel rifle will generate something less down range, but clearly still a potential for a reach in excess of 150 yards exists. .35 caliber cartridges, other than the 35 Remington, do not seem to fare well, especially the big magnums. Perhaps the 35 Remington knows its place, as do the hunters who select it for their purposes? There have been a dozen popular wildcat and factory .358 caliber magnums produced over the years. Cartridges like the 35 Newton, 358 Ackley Magnum, 350 Howell, 358 Norma Magnum, 350 Remington Magnum, etc. They all debut with great fanfare, some make it into product, but all of them fade away. My theory is that magnums are made to drive heavy bullets faster than non-magnum cartridge, in the hopes of extending range and power, but the 0.358″ is not a long range caliber. Nearly twenty years ago, I decided to neck up a 338-378 Weatherby case, or neck down a 378 Weatherby case, to accept a .35 caliber bullet and created the 358-378 RG. The result was a cartridge with 136 grains of capacity that, when loaded with copious amounts powder, pushed a 310 grain bullet out of a 26″ barrel at 2995 fps, while generating 6176 ft/lbs of muzzle energy. Kids, right? Other than being great fun to shoot, and more than a little loud and impressive at the muzzle, the cartridge held no great promise. A .338 caliber bullet has better sectional density and ballistic coefficients for improved retained velocity over the long haul. 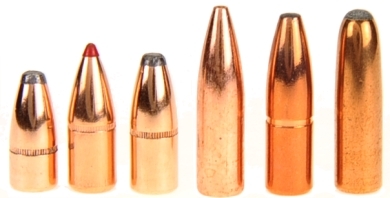 A .375 caliber bullet also offers excellent bullet characteristics as well as a weight and size advantage. Pictured above L-R 0.358 diameter bullets for the 35 Remington Speer Hot-Cor 180 grain, Hornady FTX 200 grain and Speer Hot-Core 220 grain. 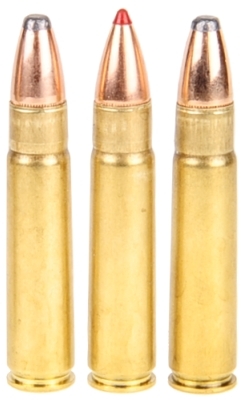 Bullets for the 358-378 RG, Barnes TSX 250 grain, Swift A-Frame 280 grain and Woodleigh 310 grain. So without any real advantage, my 358-378 RG also faded away. So why has the modest 35 Remington survived? The typical hunter is not going to shoot big and dangerous game hunt in Africa or on the Alaskan Peninsula, nor are they going to be hunting wide open plains and shooting at a long distance. They are going to try to get some time off of work during deer season, or maybe squeeze in a black bear, elk, or hog hunt with friends. Considering that in 2018 15.6 million hunting licenses were issued in the U.S., the “typical hunter” is a huge population. Of those, approximately 11 million of those hunt in short shooting distance states, either due to topography or through legislated restrictions. 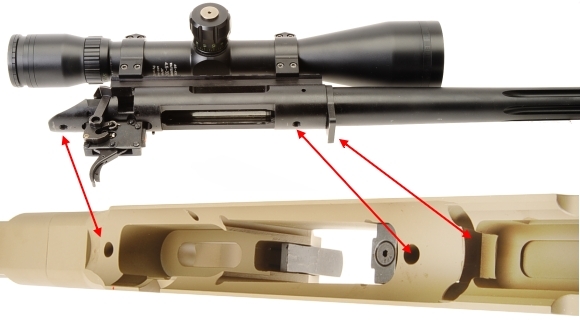 Perfect settings for the short barrel lever action rifle, as well as for the 35 Remington. 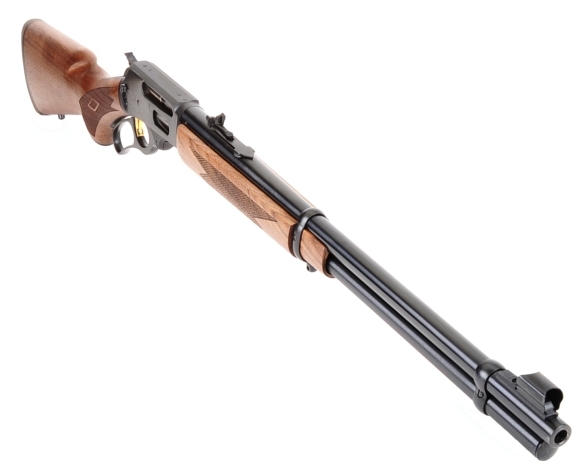 The 35 Remington is relatively inexpensive to shoot, it is not harsh recoiling and, best of all, it is chambered in a fast shooting, light weight and accurate lever action rifles. 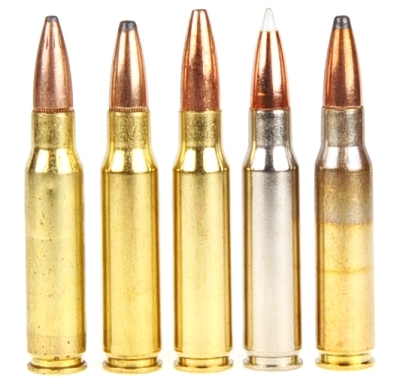 What about the 0.358″ bullets modest sectional density and low ballistic coefficient? For the hunting range expected for this combination, they don’t much matter. 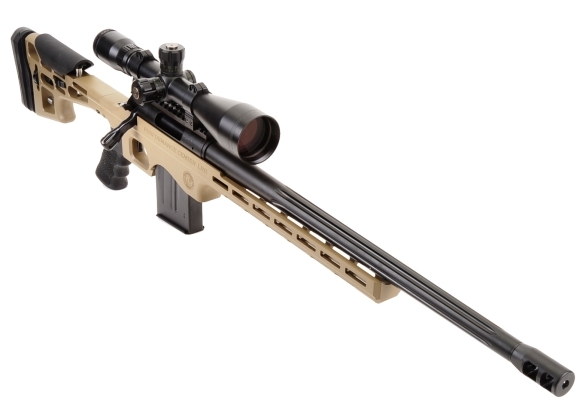 The 35 Remington bullet only has to travel 100 to 150 yards where it will account for quick kills. Warning: Bullet selections are specific, and loads are not valid with substitutions of different bullets of the same weight. Variations in bullet length will alter net case capacity, pressure and velocity. Primer selection is specific and primer types are not interchangeable. These are maximum loads in my firearms and may be excessive in others. All loads should be reduced by 5% as a starting point for development where cartridges have greater than 40 grains in capacity and 10% for cartridges with less than 40 grain capacity following safe handloading practices as represented in established mainstream reloading manuals. Presentation of these loads does not constitute a solicitation for their use, nor a recommendation. Not much to add… No compressed loads. A Lee Factory Crimp, collet crimp, was employed. 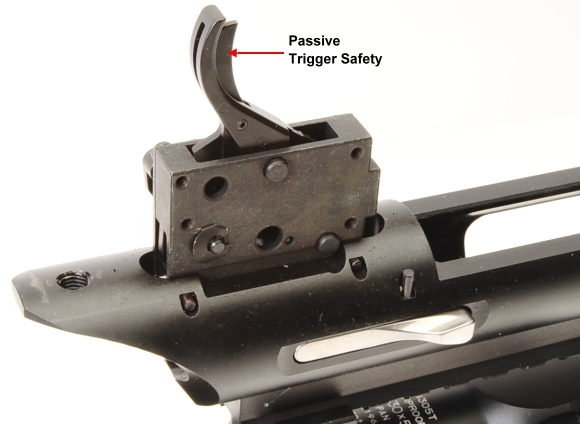 A roll crimp would do as well, but a crimp should be used where cartridges are slated for use in a lever action rifle with a tubular magazine. All of the rounds easily cleared loading, feeding and ejection. But, Joe, why are they so slowwwww? Glad you asked. 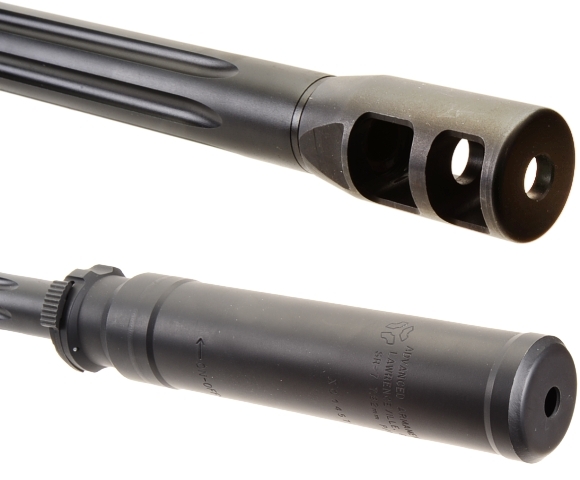 All of the manuals I reviewed used a 24″ test barrel in a universal receiver as defined by SAAMI for the 35 Remington. 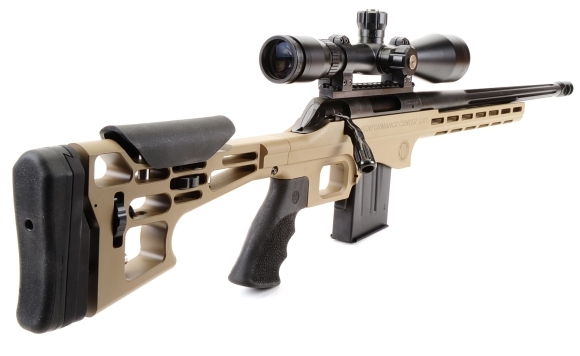 The Marlin has a 20″ barrel. Of the two, the Marlin best represents the typical 35 Remington firearm. As a baseline to help me gauge my handload results, I collected chronograph data on Hornady’s LeverEvolution 200 grain FTX 35 Remington ammunition. Rated at 2,225 fps with a 24″ barrel, fired from the Marlin 336 the same ammunition clocked 2,086 fps, or 139 fps slower. The 180 grain handloads posted here are 2,130+/-. By comparison, Speer’s max load in their manual, shot with a 24″ barrel, is 2,258, or a 128 fps difference. The 200 grain load posted here is 1975 +/-. The Hornady manual’s maximum load is 2,050 fps with the exception of 2,100 fps with their LeverEvolution powder. So a 75 fps difference in the typical case and 125 fps with LeverEvolution. Sierra’s manual indicates 200 grain bullet velocity that matches or exceeds the results of other manuals that are based on a 24″ barrel, but with a Marlin 336 with a 20″ barrel. I could not match those results without exceeding 33,500 PSI. Different components yield different results. 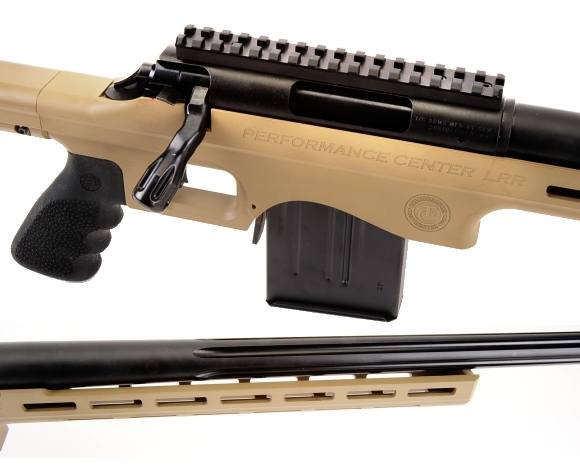 At 220 grains, the load data posted here is 1,940 fps, splitting the difference. Speer’s top velocity for their 220 grain bullet, with 24″ barrel, is 2,031 fps, a 91 fps difference. 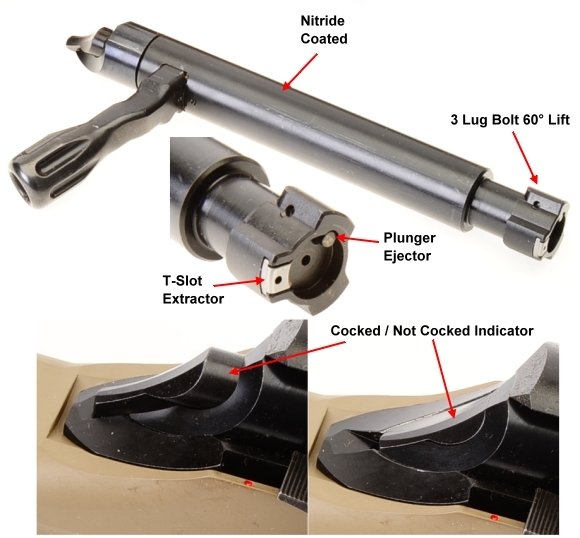 So I do not think the velocity for the posted handloads are low, I think they reflect the barrel length difference between the Marlin 336 and 24″ test barrels utilized by other sources…. which never actually find their way onto a sporting firearm. I would have had to unsafely exceed standard pressure levels to make up the difference. I am not saying that the 35 Remington cannot be loaded heavier, but that is an issue for another time. This is what the Hornady 200 grain FTX handload looks like:. More about the rifle than the cartridge. The Marlin Model 336 has endured and it still looks and feels great after all of these years, right down to the familiar black walnut stocks and deep blued steel parts. The action is slick, tracking to a moving target comes naturally and the Marlin has excellent hunting accuracy. Is the 35 Remington THE cartridge? I can’t say. These days, too many subjective factors go into cartridge selection and any of the chambers available from Marlin will get the job done. 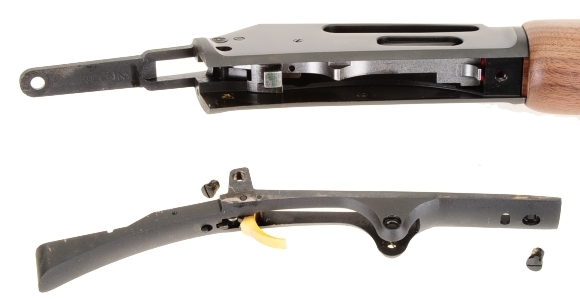 For the Model 336, there is a choice of 30-30 Winchester and 35 Remington. The big bore version, the Model 1895, offers the 444 Marlin and 45-70 Gov’t as heavier hitters. For a lightweight, fast handling gun, there is the Model 1894 in 44 Mag and 45 Colt. I’ve personally shot Marlin rifles for a very long time. The last hog I shot was with a Marlin 336 in 30-30 WCF that I have owned since 1957, my first centerfire rifle. My other Marlin is a Model 1895G in 45-70 Gov’t, the latter the fifth such rifle I’ve owned. I’ve owned just about every version of modern Marlin made. If they are so good, why have I owned so many of the same type? Good question. The modern guns are purchased, then I start modifying them with third party components until they look like a lever action version of the AR-15. At that point, I realize I have lost everything I like about a traditional lever action rifle, so I sell them and start all over again. Kids, right? Good firearms, made in America by hard working people.